^ 1.0 1.1 1.2 1.3 1.4 1.5 1.6 1.7 1.8 United States Central Intelligence Agency. Antarctica. The World Factbook. Government of the United States. 2011 [2011-10-22]. ^ British Antarctic Survey. Bedmap2: improved ice bed, surface and thickness datasets for Antarctica (PDF). The Cryosphere journal: 390. [2014-01-06]. ^ National Satellite, Data, and Information Service. National Geophysical Data Center. Government of the United States. [2006-06-09]. （原始内容存档于2006-06-13）. ^ Joyce, C. Alan. The World at a Glance: Surprising Facts. The World Almanac. 2007-01-18 [2009-02-07]. （原始内容存档于2009-03-04）. ^ Wright, Minturn, "The Ownership of Antarctica, Its Living and Mineral Resources", Journal of Law and the Environment 4 (1987). ^ Liddell, Henry George; Scott, Robert. Antarktikos. (编) Crane, Gregory R. A Greek–English Lexicon. Perseus Digital Library. Tufts University. [2011-11-18]. （原始内容存档于2014-07-15）. ^ Hince, Bernadette. The Antarctic Dictionary. CSIRO Publishing. 2000: 6. ISBN 978-0-9577471-1-1. ^ Aristotle. 5. Meteorology. Book II. Translated by E. Webster. Clarendon. 1923: 140 [350 BC]. （原始内容存档于2016-09-10）. ^ Antarctica: A Scientific Laboratory Like No Other in the World. VOA. 2009-06-02 [2016-10-30]. ^ Emily Upton. THE ORIGIN OF THE NAMES OF THE CONTINENTS. todayifoundout. 2013-05-01 [2016-10-30]. ^ John George Bartholomew and the naming of Antarctica, CAIRT Issue 13, National Library of Scotland, 2008-07, ISSN 1477-4186, and also The Bartholomew Archive. （原始内容存档于2016-03-06）. ^ Drewry, D. J. (编). Antarctica: Glaciological and Geophysical Folio. Scott Polar Research Institute, University of Cambridge. 1983. ISBN 0901021040. ^ 16.0 16.1 How Stuff Works: polar ice caps. howstuffworks.com. [2006-02-12]. （原始内容存档于2006-02-04）. ^ Bockheim, J. G. Landform and Soil Development in the McMurdo Dry Valleys, Antarctica: A Regional Synthesis. Arctic, Antarctic, and Alpine Research. 2002, 34 (3): 308–317. JSTOR 1552489. doi:10.2307/1552489. ^ Polar Research: A Survey. National Research Council (U.S.). Committee on Polar Research. 1970: 28. ^ Massive Iceberg Breaks off Pine Island Glacier in Antarctica. Climate Central. 2013-07-10 [2016-10-30]. ^ ANTARCTICA OVERVIEW MAP (PDF). NASA. ^ British Antarctic Survey. Volcanoes. Natural Environment Research Council. [2006-02-13]. （原始内容存档于2007-07-11）. 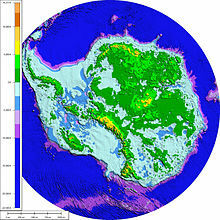 ^ Scientists Discover Undersea Volcano Off Antarctica. United States National Science Foundation. [2006-02-13]. （原始内容存档于2016-06-16）. ^ 南极有没有河流？. 中国南极测绘研究中心. 2008-04-25 [2017-01-09]. ^ 李宏. 神秘的南极（地理新视窗 ）. 青苹果数据中心. 2013-11-12. ^ Briggs, Helen. 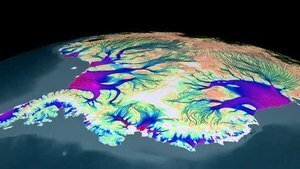 Secret rivers found in Antarctic. BBC News. 2006-04-19 [2009-02-07]. （原始内容存档于2007-05-15）. ^ Lake Vostok. United States National Science Foundation. [2006-02-13]. （原始内容存档于2013-08-11）. ^ Abe, Shige; Bortman, Henry. Focus on Europa. NASA. 2001-04-13 [2012-01-12]. （原始内容存档于2014-10-19）. ^ Extremophile Hunt Begins. Science News. NASA. [2011-10-22]. （原始内容存档于2010-03-23）. ^ Hoover, R. B; Pikuta, E. V. Psychrophilic and Psychrotolerant Microbial (PDF). NASA. 2010 [2016-11-18]. ^ Hudson, Gavin. The Coldest Inhabited Places on Earth. Eco Localizer. 2008-12-14 [2009-02-08]. （原始内容存档于2016-03-27）. ^ Coldest temperature ever recorded on Earth in Antarctica: -94.7C (-135.8F). 英国卫报. 2013-12-10 [2016-10-08]. ^ 37.0 37.1 37.2 British Antarctic Survey. Weather in the Antarctic. Natural Environment Research Council. [2006-02-09]. （原始内容存档于2013-08-11）. ^ 当代中国的南极考察事业. 当代中国出版社. 1994: 3. ^ The Earth's Elliptical Orbit Around the Sun – Aphelion and Perihelion. Geography.about.com. [2013-10-21]. （原始内容存档于2016-08-04）. ^ British Antarctic Survey. Land Animals of Antarctica. Natural Environment Research Council. [2008-11-09]. （原始内容存档于2008-10-07）. ^ Sandro, Luke; Constible, Juanita. Antarctic Bestiary – Terrestrial Animals. Laboratory for Ecophysiological Cryobiology, Miami University. [2011-10-22]. （原始内容存档于2013-08-11）. ^ Snow Petrel Pagodroma nivea. BirdLife International. [2009-10-20]. （原始内容存档于2016-06-03）. ^ Creatures of Antarctica. [2006-02-06]. （原始内容存档于2005-02-14）. ^ Penguin InfoBook. seaworld parks & entertainment. [2016-10-30]. ^ Kinver, Mark. Ice oceans 'are not poles apart'. BBC News (British Broadcasting Corporation). 2009-02-15 [2011-10-22]. （原始内容存档于2016-04-16）. ^ 48.0 48.1 Australian Antarctic Division. Antarctic Wildlife. Government of Australia. [2010-09-27]. （原始内容存档于2010-08-28）. ^ Chwedorzewska, K.J. Poa annua L. in the maritime Antarctic: an overview (PDF). Polar Record. 2015, 51 (6): 637–643. doi:10.1017/S0032247414000916. ^ 50.0 50.1 British Antarctic Survey. Plants of Antarctica. Natural Environment Research Council. [2011-07-12]. （原始内容存档于2011-06-07）. ^ Bridge, Paul D.; Spooner, Brian M.; Roberts, Peter J. Non-lichenized fungi from the Antarctic region. Mycotaxon. 2008, 106: 485–490 [2011-10-22]. ^ Onofri, S.; Selbmann, L.; Zucconi, L.; Scalzi, G.; Venkateswaran, K.J. ; de la Torre, R.; de Vera, J.-P.; Ott, S.; Rabbow, E. & Horneck, G. Survival of Black Fungi in Space, Preliminary Results (PDF). [2013-03-13]. （原始内容存档 (PDF)于2016-06-17）. ^ de Hoog, G.S. Fungi of the Antarctic: evolution under extreme conditions. Studies in Mycology. 2005, 51: 1–79. ^ Gorman, James. Bacteria Found Deep Under Antarctic Ice, Scientists Say. The New York Times. 2013-02-06 [2013-02-06]. （原始内容存档于2016-06-20）. ^ Bridge, Paul D.; Hughes, Kevin. A. Conservation issues for Antarctic fungi. Mycologia Balcanica. 2010, 7 (1): 73–76. ^ Kirby, Alex. Toothfish at risk from illegal catches. BBC News. 2001-08-15 [2011-10-22]. （原始内容存档于2016-04-17）. ^ Toothfish. Australian Antarctic Division. [2011-10-22]. （原始内容存档于2010-09-25）. ^ 各方同意在南極設立全球最大海洋保護區. BBC中文网. 2016-10-28 [2016-11-18]. （原始内容存档于2016-11-18）. ^ 研究显示远古南极洲绿色海岸曾经生长棕榈. 科技讯. [2016-09-08]. （原始内容存档于2016-09-10）. ^ 60.0 60.1 Stonehouse, B. (编). Encyclopedia of Antarctica and the Southern Oceans. John Wiley & Sons. June 2002. ISBN 0-471-98665-8. ^ Smith, Nathan D.; Pol, Diego. Anatomy of a basal sauropodomorph dinosaur from the Early Jurassic Hanson Formation of Antarctica (PDF). Acta Palaeontologica Polonica. 2007, 52 (4): 657–674. （原始内容存档 (PDF)于2016-03-04）. ^ Leslie, Mitch. The Strange Lives of Polar Dinosaurs. Smithsonian Magazine. December 2007 [2008-01-24]. ^ Bornemann, A.; Norris, R. D.; Friedrich, O.; Beckmann, B.; Schouten, S.; Damste, J. S. S.; Vogel, J.; Hofmann, P.; Wagner, T. Isotopic Evidence for Glaciation During the Cretaceous Supergreenhouse. Science. 2008, 319 (5860): 189–192. ISSN 0036-8075. doi:10.1126/science.1148777. ^ Reinhold, Robert. Antarctica yields first land mammal fossil. New York Times. 1982-03-21. （原始内容存档于2016-08-19）. 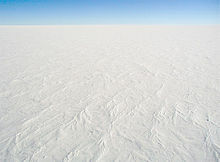 ^ New CO2 data helps unlock the secrets of Antarctic formation. Physorg.com. [2011-07-26]. （原始内容存档于2011-07-15）. ^ DeConto, Robert M.; Pollard, David. Rapid Cenozoic glaciation of Antarctica induced by declining atmospheric CO2. Nature. 2003-01-16, 421 (6920): 245–9 [2009-10-19]. Bibcode:2003Natur.421..245D. PMID 12529638. doi:10.1038/nature01290. （原始内容存档于2016-03-05）. ^ 67.0 67.1 Trewby, Mary (编). Antarctica: An Encyclopedia from Abbott Ice Shelf to Zooplankton. Firefly Books. September 2002. ISBN 1-55297-590-8. ^ Retallack, G. J.; Krull, E. S.; Bockheim, J. G. New grounds for reassessing palaeoclimate of the Sirius Group. Journal of the Geological Society, London. 2001, 158 (6): 925–35. doi:10.1144/0016-764901-030. ^ Stefi Weisburd. A forest grows in Antarctica. (an extensive forest may have flourished about 3 million years ago). Science News. 1986-03-08 [2012-11-02]. （原始内容存档于2015-03-29）. ^ Antarctica's geology. Royal Geographical Society (with the Institute of British Geographers) in partnership with the British Antarctic Survey and the Foreign and Commonwealth Office. [2014-10-31]. （原始内容存档于2014-11-22）. ^ 71.0 71.1 Beau Riffenburgh. Encyclopedia of the Antarctic 1. Taylor & Francis. 2007: 914. ISBN 9780415970242. ^ 南极丰富的矿产资源. 中国地质科学院. 数字科技馆. [2017-01-09]. （原始内容存档于2014年6月25日）. ^ 认识南极：南极有多少矿藏. 新浪科技. 2005-11-23 [2017-01-09]. ^ Potential Mineral Resources in Antarctica (PDF). Princeton University. [2016-11-22]. ^ J.D. Hansom，John Gordon. Antarctic Environments and Resources: A Geographical Perspective. Routledge. 2014: 221. ISBN 9781317897057. 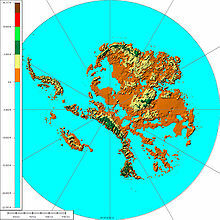 ^ GEOLOGICAL SURVEY CIRCULAR 705 Mineral Resources of Antarctica. United States Department of the Interior. 1974: 16-17. ^ 77.0 77.1 Original Text of Treaty, PDF format. ^ Flock of Antarctica's Orthodox temple celebrates Holy Trinity Day. Serbian Orthodox Church. 2004-05-24 [2009-02-07]. （原始内容存档于2016-08-26） （英语）. ^ Владимир Петраков: 'Антарктика – это особая атмосфера, где живут очень интересные люди'. （原始内容存档于2010-12-20） （俄语）. (Vladimir Petrakov: "Antarctic is a special world, full of very interesting people"). Interview with Father Vladimir Petrakov, a priest who twice spent a year at the station. ^ Headland, Robert K. The Island of South Georgia. Cambridge University Press. 1984: 12, 130. ISBN 978-0-521-25274-4. OCLC 473919719. ^ Old Antarctic Explorers Association. missing (PDF). Explorer's Gazette. （原始内容 (PDF)存档于2016-06-24）. ^ Bone, James. The power games that threaten world's last pristine wilderness. The Times. 2007-11-13. ^ Questions to the Sun for the 2002–03 season. The Antarctic Sun. [2006-02-09]. （原始内容存档于2006-02-11） （英语）. ^ Registro Civil Base Esperanza. Argentine Army. （原始内容存档于2010-01-17） （西班牙语）. ^ Corporación de Defensa de la Soberanía. Derechos soberanos antárticos de Chile. [2011-11-16]. （原始内容存档于2011-07-18） （西班牙语）. ^ Rogan-Finnemore, Michelle. What Bioprospecting Means for Antarctica and the Southern Ocean. (编) Von Tigerstrom, Barbara. International Law Issues in the South Pacific. Ashgate Publishing. 2005: 204. ISBN 0-7546-4419-7. ^ Antarctic Treaty System – Parties. Antarctic Treaty and the Secretariat. [2009-10-20]. ^ Rapp, Ole Magnus. Norge utvider Dronning Maud Land helt frem til Sydpolen. Aftenposten (Oslo, Norway: Aftenposten). 2015-09-21 [2015-09-22]. （原始内容存档于2016-03-04） （挪威语）. ... formålet med anneksjonen var å legge under seg det landet som til nå ligger herreløst og som ingen andre enn nordmenn har kartlagt og gransket. Norske myndigheter har derfor ikke motsatt seg at noen tolker det norske kravet slik at det går helt opp til og inkluderer polpunktet. ^ Mining Issues in Antarctica (PDF). Antarctica New Zealand. [2003-09-01]. （原始内容 (PDF)存档于2005-05-10）. ^ World Park Antarctica. Greenpeace.org. Greenpeace International. 2010-02-25 [2011-07-26]. （原始内容存档于2010-03-15）. ^ Greenpeace applauds Antarctic protection victory (新闻稿). Greenpeace International. 1998-01-14. （原始内容存档于2006-02-20）. ^ Antarctica: exploration or exploitation?. New Scientist. 1991-06-22. （原始内容存档于2009-01-11）. ^ Antarctic and Southern Ocean Coalition. Asoc.org. [2011-07-26]. （原始内容存档于2011-07-25）. ^ Antarctica, a tale of two treaties. New Scientist. [2008-05-27]. （原始内容存档于2014-07-20）. ^ 96.0 96.1 The Madrid Protocol. Australian Antarctic Division. [2011-10-22]. （原始内容存档于2013-01-22）. ^ Bobo, Jack A. Antarctic Treaty Papers. [2009-10-19]. （原始内容存档于2011-05-23）. 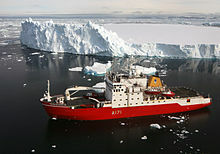 ^ Antarctic Treaty. Scientific Committee on Antarctic Research. [2006-02-09]. （原始内容存档于2006-02-06）. ^ Argentina in Antarctica. Antarctica Institute of Argentina. [2006-02-09]. （原始内容存档于2006-03-06）. ^ Antarctica Service Medal. U.S. Air Force. [2016-06-15]. （原始内容存档于2015-10-05）. ^ The Foreign Secretary has announced that the southern part of British Antarctic Territory has been named Queen Elizabeth Land. Foreign & Commonwealth Office. HM Government. 2012-12-18 [2012-12-22]. （原始内容存档于2016-06-27）. ^ Argentina angry after Antarctic territory named after Queen. BBC News. British Broadcasting Corporation. 2012-12-22 [2012-12-22]. （原始内容存档于2014-10-21）. ^ 103.0 103.1 103.2 La Antartica. Library.jid.org. [2008-11-04]. （原始内容存档于2008-10-07）. ^ 104.0 104.1 104.2 LA ANTÁRTIDA (PDF). [2011-07-19]. （原始内容 (pdf)存档于2016-04-10）. 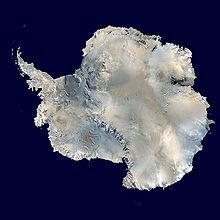 ^ THE CIA WORLD FACTBOOK 1994：ANTARCTICA. NASA. 1994-07-19 [2016-10-30]. （原始内容存档于2016-03-24）. ^ The World Factbook 2000. Central Intelligence Agency. 2000. ^ The World Factbook 2002. Central Intelligence Agency. 2002. ^ Fisheries News. mecropress. 2003-11-30 [2016-10-30]. ^ NATURAL RESOURCES. CIA. [2016-10-30]. ^ Final Report, 30th Antarctic Treaty Consultative Meeting. Antarctic Treaty Secretariat（英语：Antarctic Treaty Secretariat）. [2007-08-02]. （原始内容 (DOC)存档于2007-08-08）. ^ Politics of Antarctica. [2006-02-05]. （原始内容存档于2005-02-14）. ^ 2015-2016 Tourists by Nationality - Total. IAATO. [2016-12-07]. ^ Rowe, Mark. Tourism threatens Antarctic. London: Telegraph UK. 2006-02-11 [2006-02-05]. ^ Symes, Peter. Private Issues – The Antarctica Issues and the NORFED Issues. 2002 [2016-11-22]. ^ Robert Clancy，John Manning，Henk Brolsma. Mapping Antarctica: A Five Hundred Year Record of Discovery. Springer Science & Business Media. 2013: 70. ISBN 9400743211. ^ Flinders, Matthew. Encounter 1802 - 2002 : Collection Item View. [2015-09-06]. （原始内容存档于2016-03-03）. ^ Age of Exploration: John Cook. The Mariners' Museum. [2006-02-12]. （原始内容存档于2006-02-07）. ^ U.S. Antarctic Program External Panel of the National Science Foundation. Antarctica—Past and Present (PDF). Government of the United States. [2006-02-06]. （原始内容存档 (PDF)于2006-02-17）. ^ Guthridge, Guy G. Nathaniel Brown Palmer, 1799–1877. Government of the United States, National Aeronautics and Space Administration. [2006-02-06]. （原始内容存档于2006-02-02）. ^ Palmer Station. University of the City of San Diego. [2008-03-03]. （原始内容存档于2006-02-10）. ^ An Antarctic Time Line: 1519–1959. South-Pole.com. [2006-02-12]. （原始内容存档于2006-02-10）. ^ Antarctic Explorers Timeline: Early 1800s. Polar Radar for Ice Sheet Measurements (PRISM). [2016-02-12]. （原始内容存档于2016-03-04）. ^ Erki Tammiksaar. Punane Bellingshausen [Red Bellingshausen]. Postimees（英语：Postimees）.Arvamus. Kultuur. 2013-12-14 （爱沙尼亚语）. ^ Bourke, Jane. Amazing Antarctica. Ready-Ed Publications. 2004. ISBN 1-86397-584-5. ^ Joyner, Christopher C. Antarctica and the Law of the Sea. Martinus Nijhoff Publishers. 1992: 5. ^ Primary society and environment Book F. Australia: R.I.C. Publications. 2001: 96. ISBN 1-74126-127-9. ^ （法文） Voyage au Pôle sud et dans l'Océanie sur les corvettes "l'Astrolabe" et "la Zélée", exécuté par ordre du Roi pendant les années 1837-1838-1839-1840 sous le commandement de M. J. Dumont-d'Urville, capitaine de vaisseau, Paris, Gide publisher, 1842–1846, Vol. 8, pp. 149–152, gallica.bnf.fr, BNF. ^ 南极洲探险. 中国国家海洋局极地考察办公室. 2016-10-13 [2008-04-28]. （原始内容存档于2016-08-23）. ^ South-Pole – Exploring Antarctica. South-Pole.com. [2006-02-12]. （原始内容存档于2006-02-14）. ^ Antarctic Circle – Antarctic First. 2005-02-09 [2006-02-12]. （原始内容存档于2006-02-08）. ^ Tannatt William Edgeworth David. Australian Antarctic Division. [2010-09-27]. （原始内容存档于2010-09-29）. ^ Roald Amundsen. South-Pole.com. [2006-02-09]. （原始内容存档于2006-02-05）. ^ Richard Byrd. 70South.com. [2006-02-12]. （原始内容存档于2007-10-11）. ^ Dates in American Naval History: October. Naval History and Heritage Command. United States Navy. [2006-02-12]. （原始内容存档于2004-06-26）. ^ McMurdo Station. NSF. [2016-10-30]. 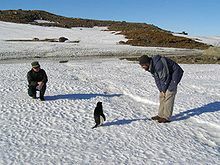 ^ Science in Antarctica. Antarctic Connection. [2006-02-04]. （原始内容存档于2006-02-07）. ^ 144.0 144.1 Graham, Rex. Adelie Penguins thriving amid Antarctica's melting ice. 2014-07-15 [2014-10-24]. （原始内容存档于2016-06-05）. ^ NASA and NOAA Announce Ozone Hole is a Double Record Breaker. Goddard Space Flight Center, NASA. 2006-10-19 [2010-09-06]. （原始内容存档于2010-10-13）. ^ Rejcek, Peter. Polar Geospatial Center Releases New Application with High-Res Satellite Imagery. The Antarctic Sun. 2013-12-02 [2014-10-24]. （原始内容存档于2015-01-07）. ^ Princess Elisabeth Station. Princess Elisabeth Station. （原始内容存档于2007-07-04）. ^ Black, Richard. Ancient Antarctic eruption noted. BBC News. 2008-01-20 [2009-02-07]. （原始内容存档于2009-01-15）. ^ Yusuke Suganuma; Hideki Miura; Zondervan, Albert; Jun'ichi Okuno. East Antarctic deglaciation and the link to global cooling during the Quaternary: evidence from glacial geomorphology and 10Be surface exposure dating of the Sør Rondane Mountains, Dronning Maud Land. Quaternary Science Reviews. August 2014, 97: 102–120. Bibcode:2014QSRv...97..102S. doi:10.1016/j.quascirev.2014.05.007. ^ 150.0 150.1 Meteorites from Antarctica. NASA. [2006-02-09]. （原始内容存档于2006-03-06）. ^ Gorder, Pam Frost. Big Bang in Antarctica—Killer Crater Found Under Ice. Research News. 2006-06-01. （原始内容存档于2016-03-06）. ^ Antarctic scientists find 18kg meteorite. New Zealand Herald. 2013-03-01 [2013-03-02]. ^ Seidler, Christoph. Antarktis: Forscher vermuten großen Meteoriten unterm Eisd. SPIEGEL ONLINE. ^ 154.0 154.1 Quick Facts on Icebergs. NSIDC. [2016-11-22]. ^ Quick Facts on Ice Shelves. NSIDC. [2016-11-22]. ^ Regional changes in Arctic and Antarctic sea ice. United Nations Environment Programme. 2007 [2016-08-27] （英语）. ^ All About Sea Ice: Characteristics: Arctic vs. Antarctic. National Snow and Ice Data Center. [2016-08-27]. （原始内容存档于2010-03-17） （英语）. ^ Shepherd, A.; Wingham, D. Recent Sea-Level Contributions of the Antarctic and Greenland Ice Sheets. Science. 2007, 315 (5818): 1529–1532. Bibcode:2007Sci...315.1529S. PMID 17363663. doi:10.1126/science.1136776 （英语）. ^ Glasser, N. Antarctic Ice Shelf Collapse Blamed On More Than Climate Change. ScienceDaily. 2008-02-10 [2016-09-01]. （原始内容存档于2015-12-25） （英语）. ^ Huge Antarctic ice chunk collapses. CNN.com (Cable News Network). 2008-03-25 [2008-03-25]. （原始内容存档于2008-03-29） （英语）. ^ Massive ice shelf on verge of breakup. CNN.com (Cable News Network). 2008-03-25 [2008-03-26]. （原始内容存档于2008-03-29） （英语）. ^ Ice Bridge Holding Antarctic Shelf in Place Shatters. The New York Times. Reuters. 2009-04-05 [2009-04-05]. （原始内容存档于2009-04-16） （英语）. ^ Ice bridge ruptures in Antarctic. BBC News (British Broadcasting Corporation). 2009-04-05 [2009-04-05]. （原始内容存档于2009-04-06） （英语）. 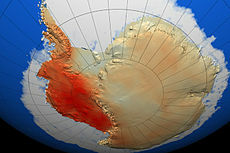 ^ Big area of Antarctica melted in 2005. CNN.com (Cable News Network). Reuters. 2007-05-16 [2007-06-11]. （原始内容存档于2007-05-18） （英语）. 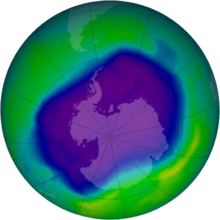 ^ 177.0 177.1 Ozone Hole Watch: Images, data, and information for the Southern Hemisphere. Goddard Space Flight Center, National Aeronautics and Space Administration. 2016-08-24 [2016-08-25]. （原始内容存档于2016-07-30） （英语）. ^ 178.0 178.1 British Antarctic Survey, Meteorology and Ozone Monitoring Unit. Antarctic Ozone. Natural Environment Research Council. [2016-08-25]. （原始内容存档于2016-03-17） （英语）. ^ 179.0 179.1 179.2 Schiermeier, Q. Atmospheric science: Fixing the sky. Nature (Nature Publishing Group). 2009, 460 (7257): 792–795 [2009-10-07]. PMID 19675624. doi:10.1038/460792a. （原始内容存档于2016-03-09） （英语）.